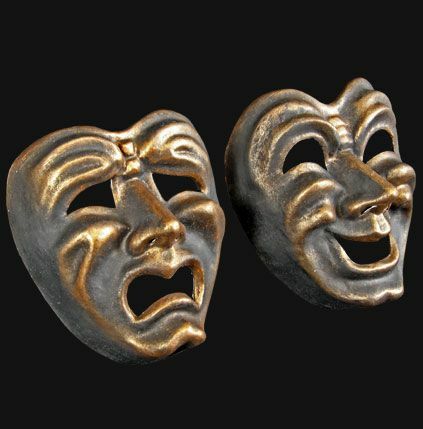 Theatre is represented by two masks. One depicts Drama the other Comedy. Playwrights of old understood that even the darkest play needs a lighter side. Today even the scariest movie have some wonderful one liners or moments of fun to break the tension. Plays and speeches – and life for that matter – need comic relief. There are all types of humour. There’s slap-stick, play on words, situational and that evil ironic humour when we laugh because we know something they don’t know. Come on – we have all at least smiled when someone makes a statement and they are not aware of all the facts. It is interesting that a good sense of humour refers to the ability not just to be funny but also the ability to enjoy it. Knowing your audience is just as important in a humorous speech as it is with any other presentation. How to get a laugh is a challenge – for me a huge challenge. But when you get that first titter from an audience you can feel yourself grow. If you could see me as I tap this out you’d be laughing. I do my writing propped up in bed with a cup of coffee to help the brain start the day. At least its not winter because then I would most probably have my mittens on along with my Swans scarf and Sharks beanie. Okay I am a little confused. One of my favourite sayings is ‘Waiting for the Sharks to win a Premiership is like waiting for Harold Holt to come home’. Yes it’s a laugh or cry situation. One of the reasons we see the funny side of things is because we recognise that ‘There go I but for the grace of God.’ Okay – not in the Sharks case. I hope you choose to laugh any time you are given the chance because it is reported to be good for your health. It reduces stress, exercises the heart muscle and creates a sense of well being. How often do we say in the middle of a crisis ‘This time next year we’ll laugh at this.’ Why not have that belly laugh now – it will make facing the drama much easier. At the end of every meeting our Treasurer and I are the last to leave and we ask each other did we have fun. (I just made myself smile – I typed treasure instead of Treasurer – and she is a treasure) But I digress. Many years ago we made a pact that when we stop enjoy ourselves we would give up Toastmasters – looks like we’ll be coming for many years to come. It is the fun in your meetings that keeps everyone coming and attracts that new member. Looking over the ramblings above what conclusions can we make. Our speeches need to mimic life by having the lighter side even in a serious speech because us humans just can’t take too much stress. Laughing is good for our health and we need to be able to laugh at ourselves. And last but not least if we use some of the vast varieties of humour we will keep our members coming back and entice visitors to join. Take up the challenge to bring laughter into your meetings and make everyone’s life a little brighter.